Last week I took my 11 year old daughter to the hair salon. 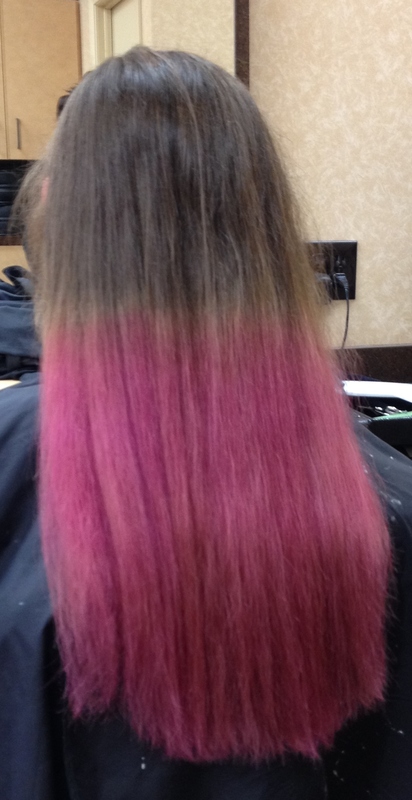 She doesn’t ask for much so when she asked if she could have the ends of her hair dyed hot pink I thought why not? It’ll make her happy, the colour is only temporary, and it will grow out pretty quick. Not a big deal. Despite the fact it took 3 full hours (because they had to first bleach the ends and then add the pink) she sat there happily without a complaint. When it was finished she climbed out of the salon chair with a huge smile on her face. It looked awesome and fun – a perfect match for her personality. She was so excited. I envied her for having the confidence to do something so bold. We walked to the cash register and a man I would estimate to be in his late 40’s who didn’t seem to have enough hair to even need to be in a hair salon in the first place looked at my daughter and then said sarcastically, “Nice parenting.” At first I thought I must have misheard him. Surely this man isn’t judging my parenting on the sole fact that my daughter’s hair is now pink? Is he? I turned back to look at him. He sat there with a disapproving look on his face shaking his head with very clear disgust. I had heard him correctly. In his little closed mind I was a terrible parent who had just turned my kid into a punk with no future. I was a crappy parent. *Newsflash – A week passed and the pink colour mostly washed out. My 11 year old daughter shows no signs of becoming a punk or menace to society. She remains a straight-A student, the Nova Scotia U12 girls provincial badminton champion and East Coast Open Champion, and the same child who was honoured by the Nova Scotia Arthritis Society earlier in the year as their 2014 Arthritis Hero at their Annual Celebrity Roast whose speech in front of over 400 people assisted them in raising close to $26,000 to send kids like her living with juvenile arthritis to Camp JoinTogether for a week at camp. Nope, not a punk. Just an all-round good kid despite being raised by someone with questionable parenting skills…according to the bald guy in the hair salon. Yesterday, little over a week from the hair salon incident, I took both of my daughters and their friend to Halifax for the Cody Simpson concert (which was truly amazing I might add). Before the concert started we went downtown to a pizza place to grab a quick bite to eat. Two other moms showed up shortly after us. They were with much younger girls, likely in the 6-8 age range. I could see the moms looking at my oldest daughter who will soon be 14. They kept looking over at her and it wasn’t hard to know what they were thinking. She was wearing short jean shorts and a short crop tank that was loose. We have a pool at our house and she wears this style of tank all the time over her bikini top. Her belly was visible and you could see her teal-coloured bra at certain angles. Not a big deal for a teen who spends two months of the year around lots of people in a bikini that is far more revealing. I was not concerned. After all, we were going to a sold-out ‘rock’ concert and it was going to be hot inside. Not to mention, when I was her age I wore pretty much the same style and miraculously turned out just fine. Had she been going to school she would have been ordered to change, but we weren’t going to school. We were going to a concert in the city. What way? Really? Are you, strangers who don’t know anything about me or my children, really implying that your parenting will produce better children than mine? For the sake of the children I bit my tongue in that moment and I watched as my beautiful 13 year old daughter who had heard every single word and had been happy and giggling all day suddenly became very self-conscious and quiet. She achieved gold level honours this year in grade 7 – the highest academic achievement awarded at her school. Her Cody Simpson concert ticket was her grading present. At the age of 8 an art collector who travels the world gathering pieces for his collection by chance came across one of her drawings that was on public display. He insisted that he be allowed to buy it and had people find us so he could meet her and have her sign and date it because he was certain it will be worth something some day. She donated the money he gave her to a local after-school program. This child of mine, the one you don’t want your children to be like, she also plays volleyball. Despite spending 16 days at the IWK Children’s Hospital last summer hooked up to machines and fighting for her life, followed by months of bed rest and physical restrictions, she still managed to earn a spot playing for one of the best volleyball clubs in the province. Her U14 team won the provincial bronze medal in April. She was the starting setter. She didn’t start the season in that position but she worked really hard and earned it. This summer she started babysitting for a family with 3 young active kids. She earns her own spending money and because she earns it herself she spends it wisely. At the Cody Simpson concert last night she bought a t-shirt and like every other kid in the Metro Centre threw it over what she was wearing. While her sister and friend complained about being too hot from wearing two t-shirts in a hot stadium my daughter was perfectly fine. I guess wearing a short crop tank wasn’t such a bad idea after all. And maybe -just maybe – despite the fact I let my kids dye their hair funky colours and wear what they want to music concerts I’m not that bad of a parent. I just parent differently than you do and so far for me it seems to be working just fine. Wow. From one often-judged parent to another, good for you for not letting it get you down. People are so … judgmental! Ugh!